Augustus Lunn (1905-1986) was a key figure in the revival of tempera painting in Britain. Lunn was born in Preston and moved to Surbiton in 1918. He studied at Kingston School of Art and won a scholarship to Royal Academy. He won the Edward Abbey Mural Scholarship. Lunn taught at the Kingston School of Art. He showed at NEAC, Cooling Galleries, London Group, Royal Academy and elsewhere. In 1985 Lunn held a solo show at the Michael Parkin's Gallery. 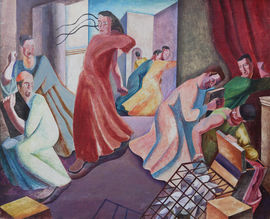 Lunn exhibited his work alongside Edward Wadsworth, John Armstrong, Eliot Hodgkin, Maxwell Armfield and Joseph Southall.